Do you battle with the removal of stubborn spots, water streaks and grime build-ups from your windows? Do they cost you too much elbow grease and you don't want to be involved in this household task? This process will no longer consume a big chunk of your time and efforts! The professionals of window cleaning in Greenwich will give you a hand! You will be able to use your leisure time as you like – the skilled and reliable experts will deal with the washing and cleaning. We provide impeccable cleaning services for all types of glass surfaces. Read on and learn more about the different perks you can get. We also provide our professional services in nearby areas: Cubitt Town, Maze Hill, St John's, Blackheath, Westcombe Park. The professionals of commercial window cleaning will provide you with top-notch service for your work environment. We can reach as high as the fourth floor of your office with our water-fed pole system. If you have windows higher than that, we will perform the washing with the help of our rope access equipment, designed specifically for hard-to-reach glass panes. All things considered, you can depend on us for thorough window cleaning of all business property types - from small shops to the highest skyscrapers in London. We are happy to use the latest strategy to ensure that you get the best window cleaning. The glass surfaces of your property will be spotless after we use water-fed extension pole cleaning system and jet washing on them. We use our trucks to supply the poles with water and we can reach up to the fourth floor. In case you need polishing of highly-placed windows, we have rope access team on hand. Call us on 020 3746 3113 and get in touch with us – these efficient techniques will bring you results right away. You can count on the skills and experience of the experts for cleaning all kinds of windows. The glass surfaces in our competence are: single or double windows, sash ones and bay windows. Of course, if you have garden windows, French doors, conservatory or roof windows, we will make them nicely-looking, too. With our progressive methods and next-generation machinery, we can cope with all types of window cleaning, even with difficult to reach glass panes. 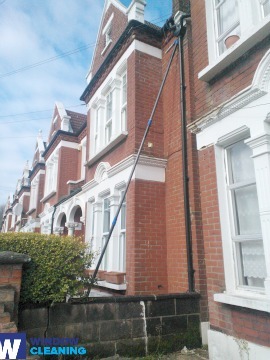 The specialists of window cleaning in Greenwich will revive your home. We deliver the finest window cleaning services in Greenwich. Our routine includes water fed extension pole system and also jet washing. We guard your health and safety with non-toxic cleaning solutions and purified water. Join our satisfied clients – dial 020 3746 3113 and get in touch with our customer care. You can also request our services online – just fill in our short request-a-quote form or use our chat option.